Over the years one of the most common questions I’ve heard is, “Do you sell a solar panel that can charge my ebike while I ride?” We can finally say, yes! Our 240 watt pack charges the all-terrain Surly Moonlander with EcoSpeed system. This 240 watt system can fully charge our 48v, 12ah battery in 2 hours and 10 minutes in direct sunlight, based on our testing. 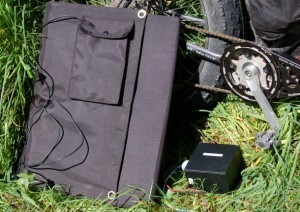 In the past, we have worked with a solar products company to create ebike solar charging kits but they have been fairly unwieldy with panels charging a small lead acid battery which is connected to an inverter which changes direct current(DC) into alternating current (AC) so that you can plug in your battery charger, which then charges the battery like usual. When you weigh all these components you have the weight of another battery and it is simply not very portable. This Spring one of our dealers, Jesse Swing of Solar Sprouts, was able to source some very high efficiency panels (24.2%) and a custom converter that outputs the precise voltage (54.6V) that is needed to charge our lithium tri-metal, 13 cell batteries. This custom converter means it can be plugged directly into the batteries. So now any customer who rides in daylight can put one of our solar charging solutions (either the 120 watt or 240 watt panels) in their pannier or mount it to a custom roof or trailer and have a vehicle that stays charged as they ride. Wondering if you will find a place to charge is no longer is an issue, because as long as there is daylight you can charge your electric bike. Taking a break for a long lunch or a half day off could fully charge your batteries even if you are far from civilization. This makes a whole category of off-road touring possible and allows for great flexibility and freedom with any electric bike touring. Folded Panel with 13 cell converter gives you the freedom to recharge anywhere there’s sunshine. We need about 4-5 weeks to ship from your order date so getting your order started now will mean you’ll have solar panels all summer long. Finally, this also opens custom options such as custom solar roofs with individual panels hard mounted to the vehicle or trailer and other custom configurations. We can also do custom wiring so you could charge 2 batteries at once, so please let us know what you have in mind and we’ll see what we can do! This is very cool!! Great work, guys. It is a great technology because it brings a whole new capability to the technology our customers already have. And these don’t just work in direct sunshine. 3.5 hours on a cloudy day with the 240 watt system and you can fully recharge our standard batteries. Hmm…makes one think of the places one could go! 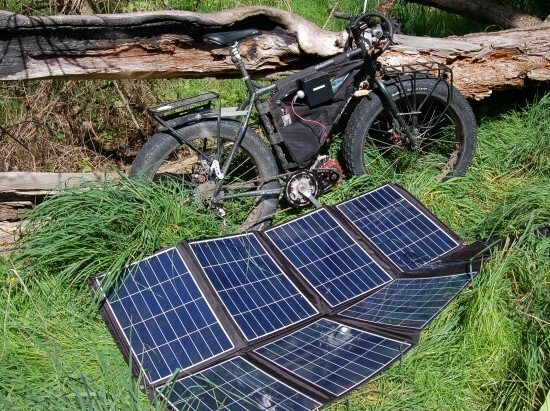 How can I buy the e-bike solar panels?